I am loving this new version of Strawberry Overnight Oats I have been eating. It provides plenty of energy for a workout and for a day of snow shoveling. At last count we had 14 inches of snow and it is still coming down! What a great time to have a Fantastical Food Fight! Thank you, Sarah! You always make this event so much fun! Overnight Oats are a fabulous way to have a delicious and healthy breakfast and save time as well. We make ours in a shaker and grab and go. Sometimes we give it a quick blend to make it more like a smoothie, like this Apple Chai Smoothie that is so yummy. 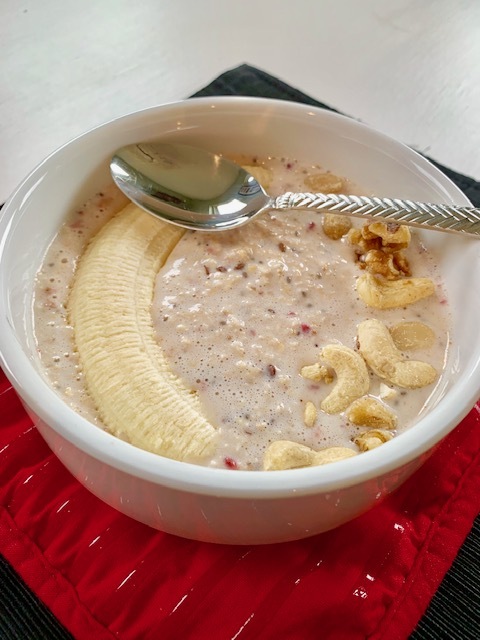 I looked into the history of overnight oats, and basically it is a type of musli called Bircher Musli made by a Swiss physician named Maximilian Oskar Bircher-Brenner. He made it for the patients of his sanatorium as a dinner. Fascinating! Delicious oatmeal that can be made to go on the road! In a blender, blend yogurt, strawberries, and milk. Place in a container (I like a shaker) and add oats and chia seeds. Refrigerate overnight. Stir in KetoSweet. Pour into a bowl. Garnish with a banana and cashews. To make this "on the go" blend all ingredients in a blender and return to your shaker container. 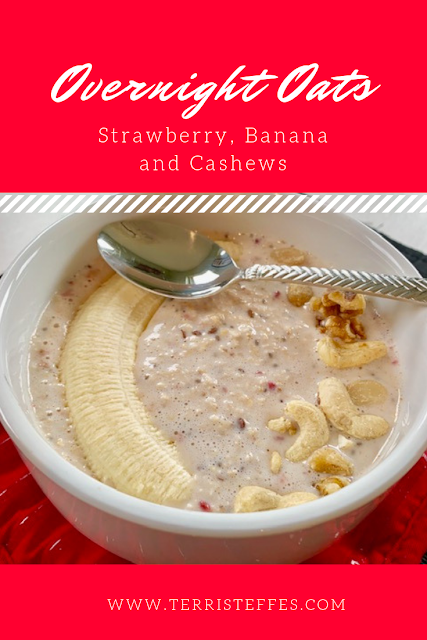 Enjoy these other overnight oat recipes and tell me your favorite combo in the comments!